I've had this composite photo of manager Casey Stengel in my collection for years. 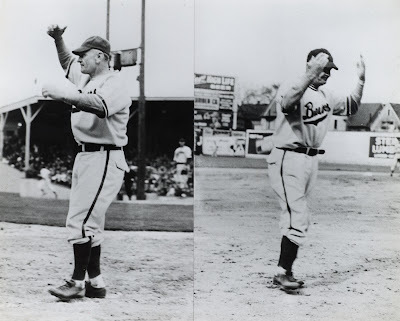 Casey, as you well know by now, took over the Brewers' managerial duties a couple weeks into the 1944 season when skipper/part owner Charley Grimm was given the reins of the Chicago Cubs. He appears to be coaching on the baseline, as his predecessor was known to do (that's the right field fence behind him in the second picture). I don't know the circumstances, but he sure doesn't seem pleased. Regardless of the outcome of this game, the Brewers gave Stengel lots of reasons to smile that season; they finished the season 102-51, taking home the American Association pennant and (much later) a spot on Minor League Baseball's "Top 100" teams of the century list.